Dr Simon Gatehouse MBBS (QLD). FRACS (Orth). FA Orth A.
Dr Gatehouse attained his medical education through the University of Queensland, Brisbane, graduating in 1996. Following hospital residency, his surgical training was completed in 2005 and he was awarded Fellowship of the Royal Australian College of Surgeons. In addition to his Australian qualifications, Dr Gatehouse has successfully sat the United Sates Medical Licencing Examinations. He has also attained full medical registration in the United Kingdom. Dr Gatehouse completed further sub-specialty training though a fellowship at the Freeman Hospital, Newcastle-Upon-Tyne, United Kingdom. This further training focused on advanced techniques in both adult and paediatric spinal surgery. The fellowship provided significant research opportunities through the Freeman Hospital NHS and The Muscle Centre, Institute of Human Genetics, Newcastle-Upon-Tyne. In addition to a busy private practice, Dr Gatehouse remains committed to further research and education. He attends and presents regularly at local and international meetings and is appointed as a Senior Lecturer at the University of Queensland. He is directly involved in Australian registrar training and the training of international spinal surgeons (AOA fellowship). He continues as an active member of the Spinal Society of Australia, the Royal Australian College of Surgeons, the Australian Orthopaedic Association, and the Australian Medical Association. Dr Gatehouse’s adult practice covers all areas of spinal disorders. His practice favours keyhole or minimally invasive disc surgery in the lumbar and cervical spine where possible. Dr Gatehouse has an interest in paediatric scoliosis surgery and treating all types of scoliosis, spondylolisthesis and other paediatric spinal conditions. 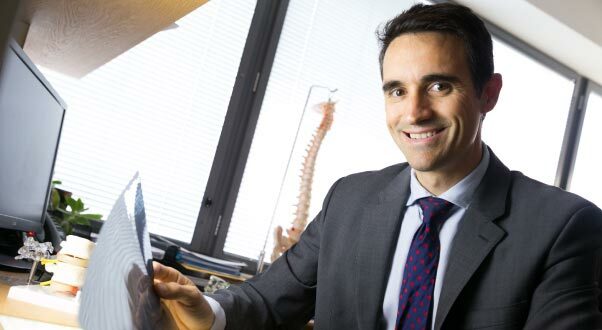 He has been involved in the development of thoracoscopic (minimally invasive) scoliosis correction and is one of a small number of Queensland spinal surgeons competent in this technique. Dr Gatehouse is a certified independent medical examiner (C.I.M.E) and conducts medicolegal consultations through his private practice.